Although it’s taken longer than science fiction fans have anticipated, we’re slowly entering the age of intelligent robotics. Many of the first robotic or ‘autonomous’ machines worked just as well as the contraptions in the 1984 Gremlins movie. However, ever since the first robotic vacuum in 1996 by Electrolux, companies have been scrambling over each other to release more improved models each year. Granted, it wasn’t until 2002 when iRobot released their Roomba that the robot vacuum transformed from a gimmick into a practical, helpful machine, but now there are countless models on the market. Luckily, we’re here to help you navigate the unfamiliar terrain by discussing important features and providing unbiased reviews. There is a multitude of robot vacuum cleaners at various price points. While it’s a general rule of thumb to go for the more expensive models when you can to ensure they do a fantastic job, recent developments have led to cheaper models that are more than capable of competing – though will likely have fewer bells and whistles. Below are our top picks in order from most to least expensive. All of these are fairly low profile which means they’re great at reaching those tricky areas under furniture, though the Dyson 360 is the tallest due to its all-seeing camera. Design & Features – State of the art robot vacuum that uses 360-degree camera imaging to assist with navigation and mapping. It also has app functionality and a variety of features which includes voice control, scheduling, and single floor cleaning (i.e. move it to another floor without the dock, press the clean button on the machine and it will return back to the position once it’s cleaned the floor or run out of battery). Performance – Using Dyson’s Radial Root Cyclone technology, this is a powerful robot vacuum that can pick up particles as small as 0.5 microns. It can be used on all flooring types as it uses a full-width motorized brush bar with 5,468 stiff nylon bristles for carpet cleaning and 2,376,000 anti-static carbon fibre filaments for hard floor cleaning. It also has tracks to ensure it doesn’t have trouble navigating tricky terrain. Value – In true Dyson fashion the 360 Eye is a little too expensive at just under a grand, but they’ve tried hard to really make this compete with regular vacuums due to the powerful V2 digital motor. 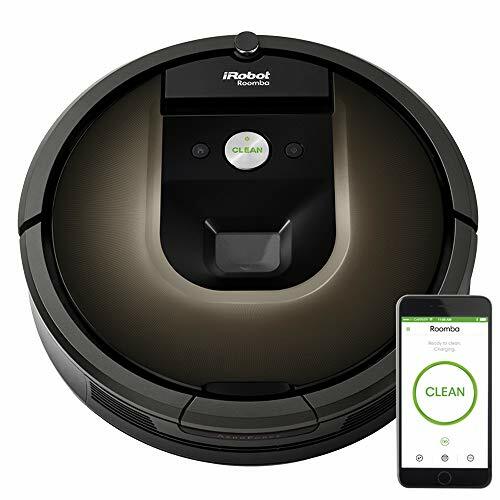 It’s a robust and well thought out machine, but you could save money and go with the slightly cheaper Roomba 980 or Botvac D7 models that have similar features and abilities. We rated the Dyson 360 Eye 8.8/10 you can read our entire review here. The only robot vacuum with a full-width brush bar, the 360eye has nylon bristles that drive down into carpet fibres to remove dirt, while carbon fibre filaments help remove fine dust from hard floors. Design & Features – The Roomba 980 is a not so surprisingly stylish robot vacuum that uses a sunken forward facing camera for navigation and mapping. It also has a host of features through the app which includes automatic carpet boost (it increases power when it detects carpets), cleaning passes (choose whether it makes one or two passes per session), and scheduling, as well as the ability to check the status of the bin, filters and more. Performance – The 980 can capture particles as small as 0.3 microns and works superbly on hard or carpeted flooring. It also has ‘dirt detect’ technology which means it will comprehensively clean any areas that are excessively filthy. Instead of bristles, it uses two rubber counter rotating extractors to prevent pet hair from becoming tangled. Value – At a little over £800 the Roomba 980 isn’t cheap, but it’s one of the most intelligent and comprehensive robot vacuum cleaners on the market. If you want a quality high-end robot then this one you shouldn’t dismiss. We rated the iRobot Roomba 980 8.5/10 you can read our entire review here. 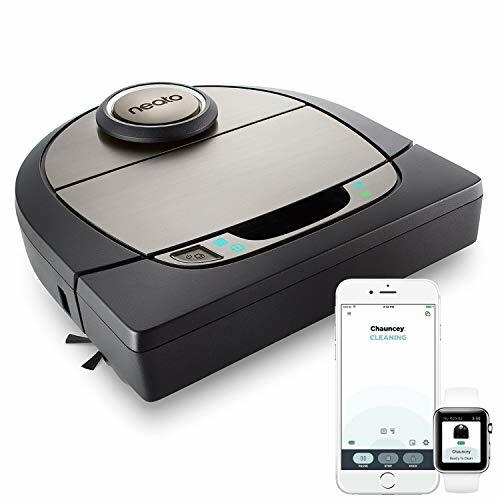 Design & Features – The Neato Robotics Botvac D7 is a laser-guided, mapping robot vacuum with app functionality which means it can clean in darkness without any issues. Some interesting features include app controlled ‘no-go’ areas, the ability to manually control it using a remote or app, an ‘extra care’ mode and much more. Performance – The D7 is ‘D’ shaped which makes it more practical for cleaning corners and edges. It also uses a special spiral combo brush which contains bristles for carpets and rubber blades for hard flooring. It’s great at picking up pet hair and can capture particles as small as 0.3 microns. Value – This is an interesting product that deserves its place toward the top end of the market (just a little under £800). Although it’s not the most affordable cleaning product, it receives consistently good reviews and is one robot that can make your life much easier. We rated the Neato Robotics D7 8/10 you can read our entire review here. Design & Features – The Eufy RoboVac 11c is a surprisingly well-equipped and elegantly styled robot vacuum at the low end of the market with an app and remote functionality. Although it doesn’t use mapping and cleans in a more random pattern, you can use either option to adjust the cleaning mode or even control it manually. Performance – This smart little robot vacuum is best suited for homes with hard flooring or thin carpets, but it does a great job of cleaning both. It’s also very quiet at around 40dB which means it can even clean while you’re watching TV. Value – The RoboVac 11c is one of the cheapest robot vacuums with app functionality which means it can compete with some of the top of the line models at just a fraction of the price – a little over £250. We rated the Eufy RoboVac 11C 8/10 you can read our entire review here. 7 Days Of Clean: Set weekly cleaning schedules and enjoy spotless floors with zero effort. No Hands Required: Amazon Alexa-compatibility means you see clean floors just by saying "Alexa, ask RoboVac to start cleaning." Built-In Wi-Fi: With the EufyHome app installed, your smartphone turns into a remote control to manually guide the cleaning. 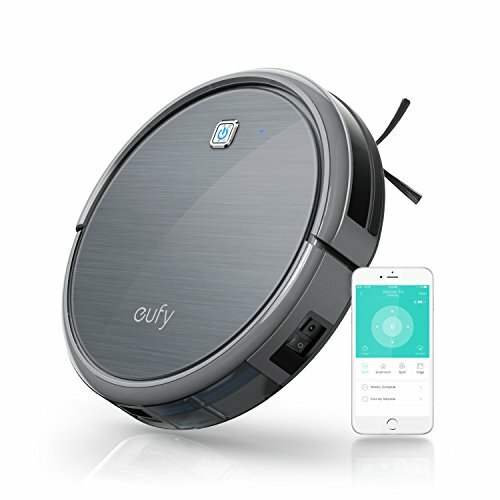 What You Get: Eufy RoboVac 11c, remote control (requires 2 AAA batteries, not included), charging base, AC power adapter, cleaning tool, high-performance filter, 4 side brushes, welcome guide and our worry-free 12-month warranty. 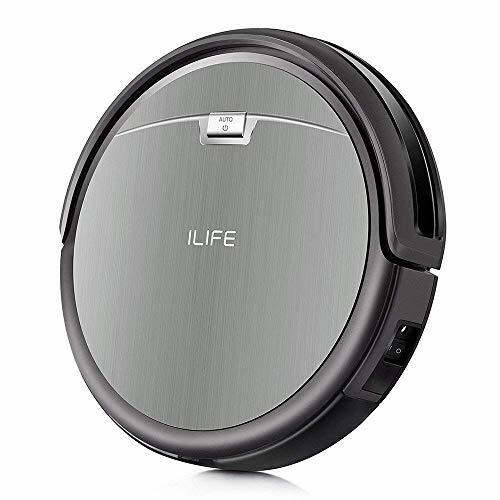 Design & Features – The ILIFE A4s is one of the slimmest robot vacuums on the market at 7.4cm and although it doesn’t have app functionality, it comes with a remote control to select the multiple available modes. It’s a simple robot vacuum to use for those who don’t like things complicated, and even easier to maintain. Performance – Although the A4s doesn’t clean in a systematic pattern or use mapping, due to the long battery life and the ‘V’ shaped brush it does very well at keeping even larger homes clean. It’s designed primarily for homes with hard flooring and thin carpets like many others and can occasionally have difficulty traversing large rugs, but still holds its own. Value – The ILIFE A4s is one of the cheapest robot vacuum cleaners on the market at just under £200, but it can help you to significantly reduce the number of times you need to bust out the old upright or canister vacuum. We rated the iLife A4S 8/10 you can read our entire review here. Powerful suction picks up dirt and dust easily, spiral blade brush does efficiently cleaning on carpet, side brushes get dirt free even in the corner. Superior battery-group brings up to 140mins cleaning time and prolonged life time, cover its works easily. Automatically returns to the charging base when power is low. MAX mode: maximizes the high suction power, specially clean for larger solid waste, such as shattered nutshell. Adjusts to floor types - thin carpet, tile, hardwood, laminate & more. Multiple smart sensors help the robot avoid bumping around or falling off stairs. Low profile design facilitates cleaning under beds, along the walls and around the clutter. What You Get: ILIFE A4s robot vacuum, remote control, charging dock, AC power adapter, cleaning tool, extra set of high-performance filters, extra set of side brushes, user guide and our worry-free 24-month warranty. Robot vacuum cleaners are small, battery-powered autonomous machines that have come a long way in their ability to keep homes around the world clean. They have the ability to self-navigate from their charging stations to vacuum your home whether you’re present or at work, and find their way back when they have finished or need to recharge (some of the really cheap models may need to be manually placed back on the charger). They do this using various sensors (which also prevent them falling down stairs) and software which can be complex or simple. Depending on your budget and the type of robot vacuum cleaner you purchase the features, functionality and intelligence will vary quite wildly – as will the performance. The dirt they pick up is collected in a dirt receptacle you’ll need to empty, though apart from that and keeping on top of routine maintenance (i.e. cleaning filters, sensors and brushes etc. ), the whole point of a robot vacuum is for you to be able to relax while it takes care of one of your least favourite chores. Why Choose a Robot Vacuum? If you’re someone who is fastidious about keeping your home immaculate, a robot vacuum cleaner may be just what you need, especially if you don’t have a lot of time. Actually, this is also true if you only decide to drag out the vacuum when family come to visit. While a robot won’t replace your main vacuum cleaner (though some folks have gotten away with it), it can significantly cut down on how often you manually hoover your home. Countless owners expressed the fact that their homes have never been so clean even if they only hoover once a month, and this even true for both budget and expensive robot vacuums. It’s also worth noting that owning a robot vacuum will drastically improve the air quality of your home by eliminating odours and cutting down on the amount of pet hair, dead skin cells, bacteria, pollen and other allergens or irritants. Before you make the decision to purchase a robot vacuum, it’s important to take the time to learn more about their common features. Doing so will ensure you make the right purchase based on your needs and bank balance. Because robot vacuums dock themselves (at least when they aren’t misbehaving), you’d think that the battery life and charging time wouldn’t be significant. However, if you have a large floor/home it may take a robot several sessions before it completes cleaning. If you also choose to buy a robot without mapping abilities (more on this below), it won’t be able to return back to where it stopped when it had to recharge. As a result, carefully consider your needs and if you need a robot with a long battery runtime. Run times usually vary between 30-140 minutes, though most new models sit toward the high end. Because they all use a lithium-ion battery which provides fade-free power, the type of battery used isn’t a consideration. However, what you will want to look out for is if the warranty includes the battery as they can be expensive to replace after a year or two. To extend the life of the battery, some models have a main on/off switch or will require you to remove the battery if you aren’t using the robot for long period. There isn’t much to say about docking stations, except that some allow you to wind up cables to prevent clutter, and most need to have adequate free space around them (i.e. 0.5-1 meter on either side and 1-2 meters in front) so the robot has no issues self-docking. Camera Vision – Some robot vacuum cleaners such as the Dyson 360 use a camera to take multiple pictures and ‘stitch’ them together to create a panoramic image. It then uses these images to triangulate its position and help it to map out areas of the home. This can make it very accurate when used in combination with infrared sensors. These are essentially the smartest navigation systems, though the only negative is that they need adequate light to be able to work so you won’t be able to get the robot to clean while you sleep and the house is dark. Infrared Sensors – Although all robot vacuums will use infrared sensors to help them navigate, detect objects and drop-offs, some use these as their primary sensors to move around the house. The main advantage of infrared sensors is that the robot vacuums can work at night time, though they are slightly less precise when it comes to navigation. Lasers – Robots that use lasers for navigation are usually held in high regard as they can easily navigate very precisely and can also do so at night time. Those who are privacy paranoid about ‘camera’ robots may also choose models that use lasers for navigation. Bumpers – In addition to proximity sensors, almost all robots will use bumpers on the front to help eliminate the risk of damage to the robot or items around the house if it has too many clumsy moments. Other Sensors – Some robots use ultrasonic sensors to help them detect distances, or even if there is an especially dirty area of the floor (i.e. through vibrations as the brush tries to clean) that requires more concentrated cleaning. Other sensors may help with maintenance and let you know when the dirt receptacle is full or the filters need to be cleaned. If you have specific areas of your home you’d like the robot vacuum to avoid you’ll want to choose a model that uses barriers. Some robots such as the Botvac D7 allow you to create a barrier using an app (only available for robots with mapping, and if the feature is included), or set up little electronic devices on the floor to set up virtual barriers to stop the robot cleaning a room or bumping into a pet’s water bowl. Many also come with magnetic strips which can also act as a barrier. Mapping simply means that the robot has the ability to create a virtual map of your home (or the main floor it will be used on). It will take some time before it ‘learns’ the layout of the terrain but it will gradually build a map that will allow it to know where it has cleaned, and where it has yet to clean. This is especially important for those with large homes where the robot will need to recharge more than once – in which case it can return to where it paused cleaning once the battery is full. Some robot vacuum manufacturers also allow you to see this data and more on your smartphone or tablet’s app. As of yet, there isn’t an option to have a robot map more than one floor of your home which isn’t ideal, though it’s something that is certainly in the pipeline. If you need to clean another floor or a single room, all robot vacuums allow you to select the auto clean function. Also, if you decide to choose a robot without mapping capabilities, it can still do a great job of cleaning your home but may do so in a seemingly random order and take more time. Most robot vacuum cleaners come with a range of modes and features. While some robots can have certain modes that can be activated from buttons on the robot itself (such as auto, spot and edge cleaning) most of the time anything other than the auto cleaning mode will need to be controlled via a remote control or app. 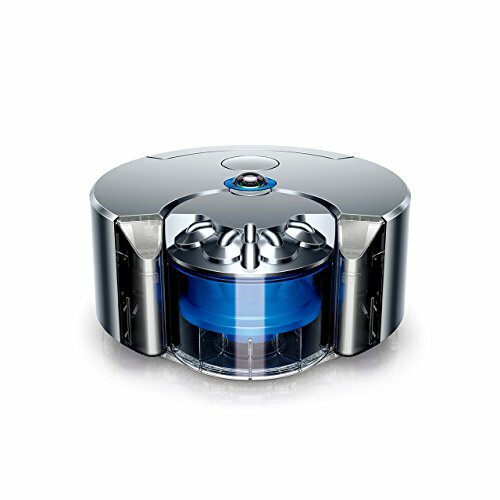 Auto Cleaning – By choosing this mode the robot will automatically start cleaning the floor the dock has been set on. When it’s finished cleaning or needs to recharge, it will return to the dock. Manual Cleaning – If applicable this mode allows you to manually control the remote via the app or remote (sort of like an RC car). Spot Cleaning – This mode provides you with the option to let the robot clean a certain spot which is handy if you’ve just spilt some sugar for instance. Edge Cleaning – If you feel the edges and corners are being neglected, this mode makes the robot follow along with the edges of a floor or room. Eco/Max Mode – By default most robots will work in a standard eco-mode, although it’s possible to change to a ‘max’ mode if included. Keep this in mind when looking at quoted runtimes as they always refer to the standard model. The max mode usually cuts the runtime in half. Scheduling – One of the biggest advantages of having a robot vacuum is scheduling it to clean when you aren’t home or are asleep. Some allow for daily scheduling, while others can be scheduled to clean more than once a day. The majority of robot vacuums are designed for hard flooring or short pile carpets. If you have long pile carpeting, pay attention to reviews and the type of brush or roller the robot uses. Robots that use a brush are great for cleaning carpets and picking up pet hair, though you will need to remove the brush frequently to cut away the hair and remove any other clogged debris. Some robots use rubber rollers or don’t have rollers at all to avoid this problem, though maybe less effective on carpets. Mobility is another area you’ll want to pay close attention to. Most robot vacuums won’t have any issues getting over room dividers, but some may have trouble manoeuvring onto rugs, or at the least flick up the edges in the process. Whether the robot has tracks or wheels, the mobility will vary and the best way to ascertain how effective it is will be to read reviews and watch videos before buying. Lastly, when comparing robot vacuum cleaners consider how large the dirt receptacle is and how easy it is to maintain. You’ll likely need to empty the dirt receptacle once every day or two and clean the filter system at least once a month depending on how dirty your home is. Unless the robot has a bin full sensor, it will probably continue cleaning and perform a less than adequate job until the dirt receptacle is emptied so you’ll have to get into the habit of emptying it. Some robots have washable filters while others have replaceable filters or a combination of the two. There isn’t necessarily an advantage of one over the other, though replaceable filters are usually the HEPA and will provide better protection against bacteria and allergens. Another area you’ll want to consider is how easy it is to remove and clean (or replace) the brushes. This will include any side brushes that work to brush dirt and debris into the centre and the main brush that will likely become tangled with hair – especially if you have pets. Lastly, you will occasionally need to use a cloth to polish the sensors to ensure they work properly. Having gone through the rigmarole of choosing and purchasing a vacuum cleaner, Will knows best the absolutely horrendous journey of a vacuum cleaner consumer. He now focuses his time and attention on helping you find the perfect vacuum cleaner for your needs. Top Ten Vacuums is here to provide you with the best, most thorough reviews of every type of vacuum cleaner. We personally purchase and test each product we discuss, to give you the most comprehensive recommendations for vacuum cleaners. Copyright © 2018 TopTenVacuums | All Rights Reserved.